Expected to debut at IAA 2017. As Audi continues with the development of the 2018 Audi A8, a test mule has been spied with the usual cammo wrap. 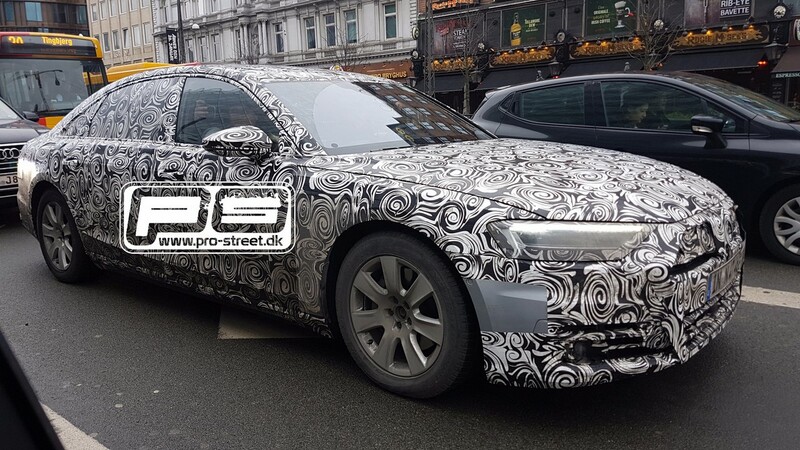 Pro-Street.dk recently spotted a next-gen Audi A8 test mule on the streets of Copenhagen, Denmark. The fourth generation Audi A8 (codename: Audi D5) will have a design inspired by the Audi prologue concept. As the test mule hints, the fourth generation Audi A8 (codename: Audi D5) will have a design inspired by the Audi prologue concept. The new generation model may not grow much in size, but it is expected to have a longer wheelbase for more interior space. Up front, the future A8 features a new, wide Singleframe grille flanked by sleeker and more aggressive LED headlamps and new design bumper. The profile is largely unchanged, save for the new door mirrors and a more coupe-esque roofline at the rear. The redesigned tail lamps seem to cover more of the trunk lid's width and feature OLED tech. The interior changes should consist of redesigned dashboard, centre console and door panels, fully digital instrument cluster and new trim and upholstery choices. Audi will use the familiar MLB-Evo platform for the fourth-gen Audi A8. As a result, the flagship saloon will shed around 200 kg to offer better performance and fuel efficiency. Engine options will reportedly include a 3.0L V6 supercharged TFSI, 4.0-litre TFSI V8, and 6.0-litre W12 petrol units, as well as 3.0-litre TDI V6 and 4.0-litre V8 TDI diesel motors. As for the electrified variant, the company has planned a plug-in hybrid this time, and will equip the 2.0-litre TFSI four-cylinder engine with an electric motor. The new Audi A8 range will have an 8-speed automatic transmission and quattro all-wheel drive system as standard. Audi will use the familiar MLB-Evo platform as the basis for the fourth-gen Audi A8. The 2018 Audi A8 could debut at the 2017 Frankfurt Motor Show (2017 IAA), with sales commencing in early 2018. An Indian launch of the all-new Audi A8 should happen later in the same year.